Hello all, due to unforeseen circumstances, I had no choice but to put time spent writing blogs on hold, but now that I’m back I wanted to share with you this article that was inspired shortly after the E3 event that was held over a month ago. So unless you’re a geeky person, it’s very unlikely you’ve heard of the E3 conference that’s held in Los Angeles every year. It’s an event that showcases all the latest and future games that will be coming to all the games consoles. The stage times held by Sony and Microsoft are very limited in seating and so they invest in a lot of money to live stream the event to the public around the world. 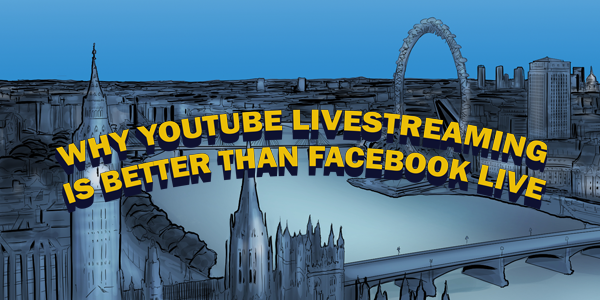 The live streams are held across multiple websites but are mostly focussed on Facebook and Youtube. I notice big differences between both Facebook and Youtube when it comes to reaching an audience through a live stream. Even if you’re not a huge company such as Sony, and more than likely a coach or an influencer looking to do their own thing to grow an audience, I wanted to establish and justify for me, why Youtube live streaming is better than Facebook. A problem I see with Facebook is that when a coach livestreams, the only people who are watching the video are those in their friends list. Even if it’s a fan page they promote on, unless viewers share the videos to others, no one new is seeing or interacting with the video unless they pay to promote through campaigns. If the video isn’t designed to go viral, it won’t. It actually breaks my heart to see friends who are coaches, who give so much value to their audience, fall flat because no one new is introduced to the content. Youtube on the other hand promotes your live stream to your chosen niche in the world for FREE. There have been many occasions that as soon as I go to the homepage of Youtube, I am shown a playlist filled with current live streams of the niches I’m most interested in. All promoted for free I might add! The difference here is that Youtube is more than encouraging to viewers and the influencer to share and embed the live stream to other platforms. If viewers enjoy the content, they help the influencer to get more views, subscribers and if they are clever to monetise the live stream, they will also make money from it too. Facebook may be encouraging its live stream viewers more and more to interact with the influencers, but in my mind it still doesn’t compete with the interactions that Youtube gives. Youtube has introduced a newer version of its chat feed and called it ‘Superchat’. Superchat not only gives the viewers a voice and influencers control over admin, but they can also choose to donate money to the influencer if they like what they see (that sounds dirty!). The influencer is notified instantly and is given plenty of opportunity to thank the payees for anything donated. Facebook doesn’t promote to new audiences, there’s no monetisation over the videos and there’s little encouragement for viewers to reward the influencer for their hard work. so if that’s not a reason enough to use Youtube instead of, if not as well as Facebook, I don’t know what is! I’ve had enquiries through about Youtube training, but there is now a waiting list! I can only take on two new clients a month due to other project commitments and making sure I can give 100% dedication to helping my current clients with Youtube. So If you are interested in training, I would love to hear from you and see if we are right for each other next month or the month after.